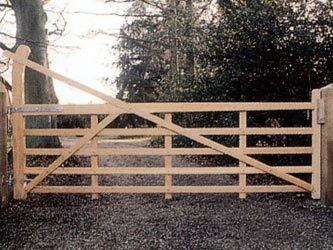 This popular design, with it's extended curved hanging stile and long diagonal brace, makes an attractive entrance as a single gate or can be paired with the small Yeoman. This traditional design incorporates mortise and tenon joints, 'water' joints at each end of the top rail and bolts at all crossings. Available in Iroko hardwood, the components are all planed, with stop chamfered top rail and sides. Recommended Gate Post size is 7' high with the diameter listed below.